Tell us about your Internet service! Residents in the WestNGN - Land of Sky Region - Is your service reliable? Do you want or need better service? This survey is for all residents of Buncombe, Haywood, Henderson, Madison and Transylvania Counties. This survey will lead to a better understanding of broadband coverage in the region. Results will be used to develop deployment plans in partnership with the NC Broadband Infrastructure Office. The goal is to attract private investment and further develop public-private partnerships to better serve the region. Contact Erica Anderson at 828.251.6622 or erica@landofsky.org for questions. Developing a structure for broadband deployment is critical to the ability to attract businesses and entrepreneurs in advanced technologies, export opportunities, and professional and technical services. High-speed access is also critical for training the region's workforce to a level that the advanced manufacturing sector and other technology-intensive businesses demand. Without direct and focused investment in this infrastructure, the region will slip further behind the rest of the state's technology advancements. Project Goal: Attract and leverage private investment from telecommunications companies. 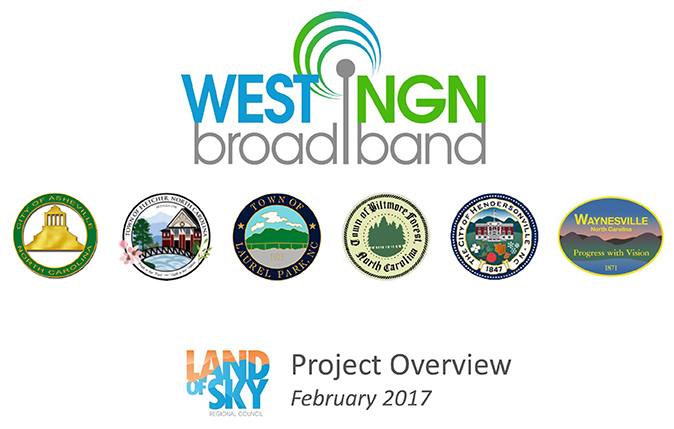 West Next Generation Network (NGN) Broadband is a regional initiative focused on stimulating the deployment of broadband networks in Western North Carolina. WestNGN’s goal is to encourage private sector providers to deliver ultra-fast bandwidth at highly affordable prices to ensure our region remains competitive and at the forefront of developing the next-generation applications essential to all sectors of the economy. This effort is led by six municipalities and universities with support from Land of Sky Regional Council. Need: Bandwidth and high-speed access are the technological equivalents of highways and electricity. Contemporary and cutting-edge knowledge-based businesses and industries need bandwidth, fiber, an educated workforce, and a great place to live. Lack of affordable broadband services threatens our region’s ability to remain competitive and maintain its reputation as home to multiple hubs of technological innovation. North Carolina should ensure our residents and businesses are able to enjoy the benefits of these advanced technologies so as to promote economic development, improve local government services including access for anchor institutions, remote healthcare and reduce the digital divide. The Land of Sky region has a strong entrepreneurical foundation, excellent quality of life, and growing technology sectors. WestNGN is working toward continued focus on high-speed gigabit, middle-mile and last-mile fiber. This multi-pronged approah is necessary to bridge the digital divide common to our rural areas and ensure continued economic development opportunities.